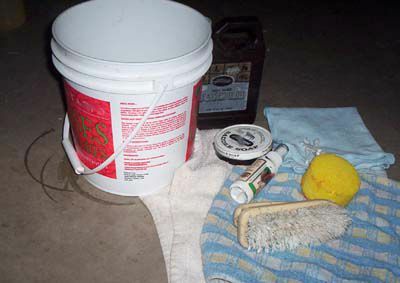 Many older horse books state we should clean our saddles every time we use them. However, that may not be practical. How often you clean your saddle may depend on how it is used. If you only use your saddles on weekends for leisurely pleasure rides, you might not need to clean your saddle as frequently as someone who participates in a sport where the saddle is exposed to sweat, mud, and dirt regularly such as distance riding or cross country jumping. 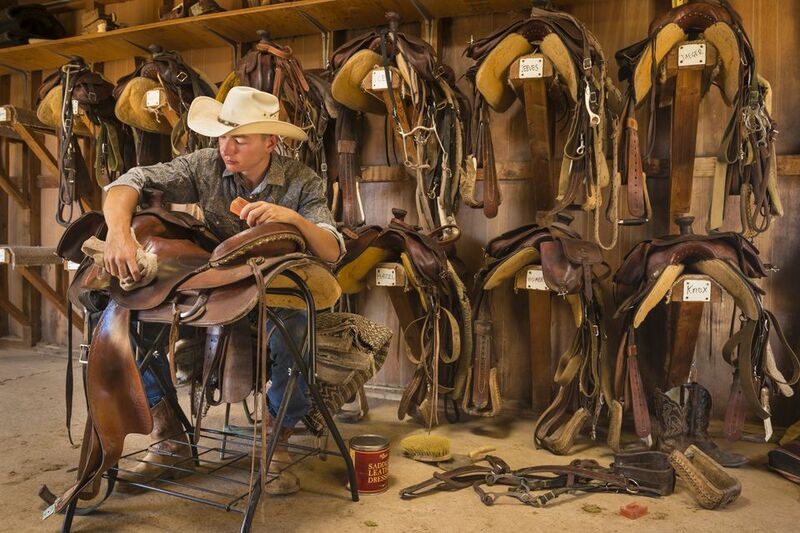 If you keep your saddle uncovered in a dusty stable, or ride in a dusty arena, you may want to clean your saddle so that grit doesn’t ruin the finish and dry the leather out. To protect your saddle, use a saddle cover of breathable material and wipe it with a dry cloth after every use. Or a quick wipe with a soft, damp cloth may be all a saddle needs. You may also want a saddle stand, sawhorse, or two chairs placed back-to-back to put your saddle on while you work. This will give you a sturdy work surface. Dampen the sponge in the water. You’ll want it damp, but not dripping wet. Dip it in the saddle soap and work up a lather. If it’s the first time you’ve clean your saddle try any leather cleaner, especially all-in-one cleaners on an inconspicuous spot on your saddle. Choose all-in-ones carefully because some all-in-one cleaners that promise to clean and condition in one step may not be good for leather. Some contain detergents that over time, can damage the leather. Some can discolor your leather, so be sure you can live with the color change. Most will darken the leather, and this is to be expected. But if your leather has a colored finish, you don’t want that removed. Apply the lather to the leather. Work in small circles covering all surfaces of the saddle; top, underside, and between flaps. On an English saddle, be sure not to over-wet the underside, as this can soak the wool flocking under the leather, causing it to compact. Frequently rinse and re-lather the sponge. Do not apply soap or water to suede or roughout leathers often found on seats or knee rolls. Give these a rough-up with a stiff brush—just enough to loosen the dirt. You don’t want to wear through these softer leathers. In areas where the 'jockey' is built up--that thicker, black layer of dirt that tends to build under the stirrup leathers, repeat the soaping a few times, without wetting the leather too much. Pay special attention to where sweat has soaked through the leather. Brush the underside of a western saddle lightly with a stiff brush. Did you know you can have this fleecy layer replaced if it gets too worn and dirty? Wipe the saddle with a damp towel and then a dry towel. You’ll want to remove any residual soap from the leather as soap left behind may damage the leather over time. Some saddlers recommend using only a damp cloth and no soap. Residual soap left in crevices and folds will also hold grit that can eat away at the leather. Use dampened cotton swabs or the corner of a towel to get all soap out of tiny stitching channels and crevices. Wipe the saddle dry. The next step is conditioning, and most conditioners work best on leathers that are a tad damp. Apply a non-detergent leather conditioner such as neatsfoot oil, lanolin or beeswax conditioner to the leather. Make sure you are using real, not synthetic neatsfoot oil. The container will say something like “animal-based” or "100% Pure". Apply the oil very sparingly. You don’t want to clog the pores or give dirt a place to cling to. Too much oil can soak through the leather into the padding or tree underneath and cause damage. Be aware also that some conditioners will darken the leather. If you don’t want your leather saddle to darken choose a conditioner accordingly and test in an inconspicuous place. Beeswax and other thick conditioners can leave a residue, so be prepared with toweling and elbow grease to buff this away. Wipe down all metal fittings such as stirrups and buckles, and remove any residual soap or conditioner that may have gathered on them. Use an old toothbrush or cotton swabs to clear out any small areas where soap or conditioner are caked. Follow the same steps of applying soap and conditioner to clean the stirrup leathers. This is a good time to check their condition and ensure they're still safe. Metal cleaner can be used on stirrups, but they can also be cleaned with regular dish soap and water. Rinse well. Be careful if you clean the metal fittings on the saddle with metal cleaner that the cleaner doesn’t get into the leather. Try placing a corner of a towel between the leather and the metal, to protect it. Vinegar works well on metal fittings too. Very occasionally you may want to make suede or roughout seats or knee rolls look nice. Use a stiff bristle brush to brush up the nap. Do this very infrequently. Too much brushing will wear through the suede, and you’ll end up holes. You may want to do this step only if you're trying to make the saddle look extra good for a special show or to sell.